My family is fighting a cold right now, so I made a purple kale soup full of antioxidants and other disease fighting ingredients for dinner. I’ve been reading more about kale lately, and just can’t say enough about the health benefits it offers, with its high levels of iron, protein, phytonutrients, antioxidants, and other healthy components. Purple kale has even more to offer! Here’s the article that inspired my soup recipe and describes some of the specific benefits of the phytonutrient, anthocyanin, found in purple vegetables. I didn’t use their recipe, because I wanted to add more vegetables and spices that would help us fight off this cold. I also wanted to include some turkey meat, which has tryptophan and of course lots of protein for growing children (and hungry adults). Before I share my recipe with you I want to tell you more about the health benefits of some of the ingredients. 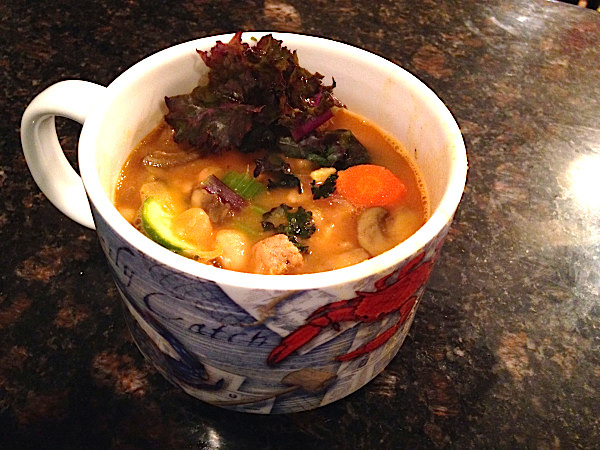 First, there are lots of veggies in this soup. Have I told you before that I think of vegetables as “God’s medicine?” Well, they are full of thousands of nutrients and micronutrients (many of which have not even been discovered yet), which are combined in health promoting ways that cannot be replicated by modern science. I’ll give you just a little insight into the many benefits of the veggies in this dish. Mushrooms, onions, and garlic are very good at boosting your immune system, and have antibacterial, antiviral, and anticancer properties. Mushrooms also have high levels of vitamin D, a nutrient which around 80% of Americans are deficient in! Seriously, if your child keeps getting sick try to give them more mushrooms and get them outside more (your body makes vitamin D when you are in the sun). I’ve started giving my kids a D3 supplement, too. It really boosts the immune system! Tomato paste has high levels of lycopene and vitamin C, both of which fight disease. Carrots have vitamin A and C. Lemon has vitamin C and can help regulate your sugar levels, which will also help you fight disease. Oregano also has strong antimicrobial affects. In fact, you can find it in supplemental form at Sprouts and my nutritionist often recommends it when I’m fighting a cold. Celery helps to clean out your lymph system, which can easily get backed up when you are sick. If your lymph system is backed up you can’t get rid of the toxic junk created by your virus or other sickness, and this seriously impedes your ability to heal. This kind of back up can also turn a viral bug into a bacterial infection. For lots of great information on kale, check out this article! Turmeric deserves its own paragraph! It has very strong anti-inflammatory properties, and inflammation is a major cause of disease. You are more prone to become sick if your body is inflamed, and you become inflamed when you are sick…it’s a vicious cycle! Seek out foods that fight inflammation if you want to feel and be healthier. New studies are also showing that curcumin, one of the ingredients in turmeric, can have the same effects as anti-depressant drugs, when taken in high doses. Well, that’s not entirely accurate. It has the same good effects on mood, without all the undesirable side effects! I’d call that a superfood!!! Plus, it gives your soup a beautiful yellow color. Make sure to use pepper with it, because the pepper will help your body absorb it. If you’re still not convinced that veggies (and spices in this case) are “God’s medicine,” let me share with you my own family’s experience. My kids used to be very sick most of the time. It was a rare week when no one in the family had a fever. Since we changed our diet in June we have still had a few colds, but only one fever that I can remember. That fever was only around 100 degrees, so I guess it technically didn’t count as a fever. Healthy eating makes for much healthier people!!! By the way, it’s OK if you can’t get the kids to eat everything in this soup. One of my kids loved the whole thing, but the other 3 definitely picked out parts of it. They’re still getting lots of the health benefits, even if they only eat part of it. Keep trying! You’ll be surprised at what they’ll eat, and what they’ll acquire a taste for! Using a large dutch oven sauté onions, mushrooms, carrots, and celery in the coconut oil until they are tender. Do not over cook! Season with salt and pepper. Add garlic, tomato paste, and turmeric, and stir until they are well incorporated. Add meat, herbs, and broth, then bring it to a boil. Add zucchini, purple kale, and lemon juice at the end. The veggies will wilt in the heat, but will still maintain they’re healthy nutrients if you don’t overcook them. I add the lemon juice at the end to maintain the integrity of the vitamin C (vitamin C is destroyed by cooking). I want to invite you to join with others who are making healthy changes. I’d love to walk alongside you in your journey towards wholeness and health!